I was recently introduced to a website called ModCloth and boy, oh boy, I'm addicted. No stranger to internet shopping, I've visited my fair share of online shops but there was something different about ModCloth, something that drew in the eye - the versatility and uniqueness of everything on there. If you've been following this blog for a while, you'll know that the way I dress changes with the wind from pretty girly to more grungy whilst many of the clothing items themselves remain the same. Upon first glance, the Way I Galaxy It looks like it should only be worn at an evening party or prom, but that simply isn't the case! 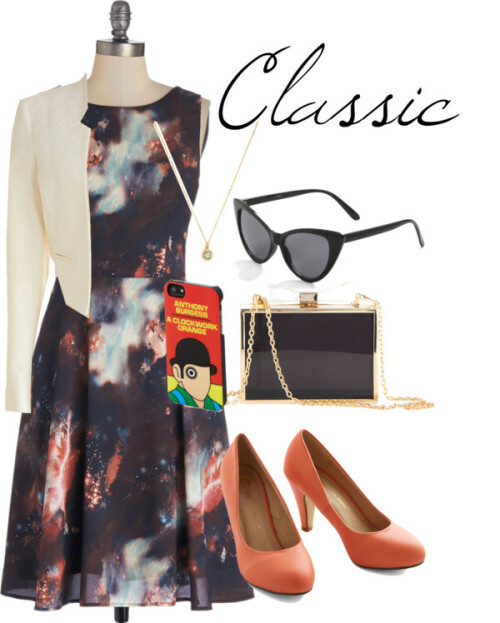 Whilst it can be styled like the image above, with a classic white blazer, coral pumps, a clutch and very retro cat eye sunglasses (all from ModCloth), there are other alternatives. This look would be perfect for a dinner or smart casual event - the tailored blazer adding a more formal look to the whole outfit. I'm particularly loving the shoes which pick up the oranges in the dress, which is perfect for spring! Did you notice that sneaky phone case? Only one of my favourite books! But if you don't attend many functions, have no fear, the dress is perfect for day wear as well! Denim outerwear is everywhere - from oversized Levi jackets to denim vests, they are definitely an item that needs a spot in your wardrobe and they help make everything a bit more casual! 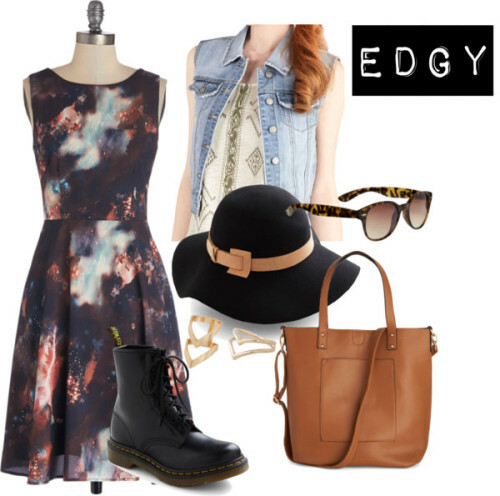 Throw a denim vest over the galaxy print dress to take it to the day, add the perfect floppy hat, some combat boots, layer up the midi rings and grab a tote bag - you're ready to go. I'm particularly loving the tote which is so reminiscent of the coveted Madewell tote but it actually has a shoulder strap! I thoroughly dislike wearing bags on the crook of my arm so this bag is perfect - not to mention it will go with everything! Don't forget that modcloth is bursting at the seams with countless vintage esque dresses! Click here for more!